cassia seed, chia seed, blueberry, carrot, Chinese wolfberries, grape seed, broccoli, Brussels sprouts, yellow pepper. Q How do cassia seeds support eye health? Cassia seeds are used as a tonic for the liver, eyes and kidneys in Traditional Chinese Medicine (TCM). An unhealthy liver cannot rid the body of toxins effectively. This leads to more toxins in the bloodstream, causing free radical damage to the eyes. Cassia seeds help neutralize free radicals and protect the liver by boosting the activities of antioxidant enzymes. Q How do chia seeds support eye health? Chia seeds are rich sources of alpha-linolenic acid (ALA), a plant-based omega-3 fatty acid with powerful anti-inflammatory effects that may help reduce eye conditions linked to oxidative stress and inflammation. In particular, omega-3 deficiency has been linked to dry eye syndrome, and low levels of DHA and EPA have been associated with eye diseases such as diabetic retinopathy and age-related macular degeneration. Q How do blueberries support eye health? Blueberries are packed with anthocyanins—powerful antioxidants that protect the retina from free radical damage. Q Who should consume E-View? E-View is suitable for everyone, in particular, students, office workers who stare at computer screens all day, the elderly and anyone with a low dietary intake of colorful fruits and vegetables. Q How do I choose between E-View and Vision? Vision’s main ingredients of cassia tora and grape seed are very rich in OPCs and antioxidants, such as vitamin C and E, that may be beneficial for retinopathy and cardiovascular disease. 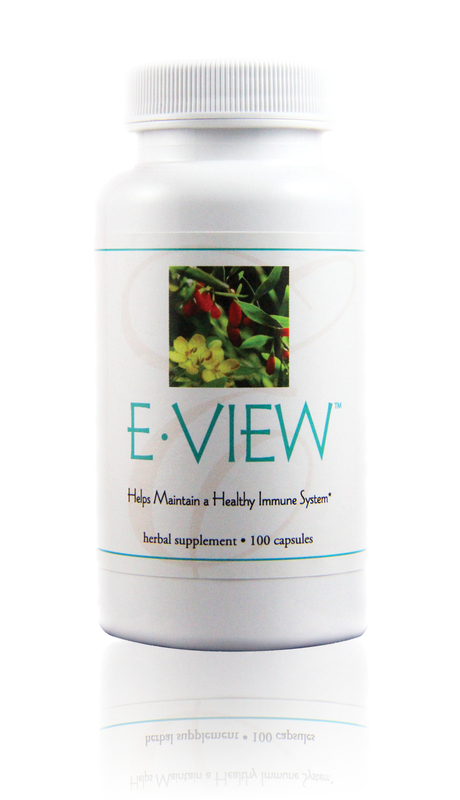 E-View, on the other hand, contains an assortment of wholesome fruits and vegetables that are naturally high in the antioxidants, lutein and zeaxanthin, which have a particular affinity for tissues and structures of the eye. Lutein and zeaxanthin occur in high concentrations in the lens, retina and macula. For this reason, lutein and zeaxanthin appear to be crucial to healthy vision. Many studies combine lutein and zeaxanthin with other antioxidants, such as vitamins C and E. This combination of nutrients may be more helpful than any single nutrient, making E-View and Vision a great combination for your eye health.